Apple removed the ability to burn disc images from Disk Utility in OS X 10.11 and newer, and while that makes sense for many Macs that no longer have SuperDrives, CDRW, and DVD burners, for those who use an external burner, use disc drive sharing, or who do have hardware with a built-in SuperDrive, may find it frustrating to lose such a feature. But not to worry, you can still burn disk images and data discs in OS X El Capitan, and you can start the process either from the Finder or from the command line on the Mac. Note this is not necessary in older versions of OS X, which allowed burning ISO files from Disk Utility. This is exclusively for OS X El Capitan and later, where the feature no longer exists. 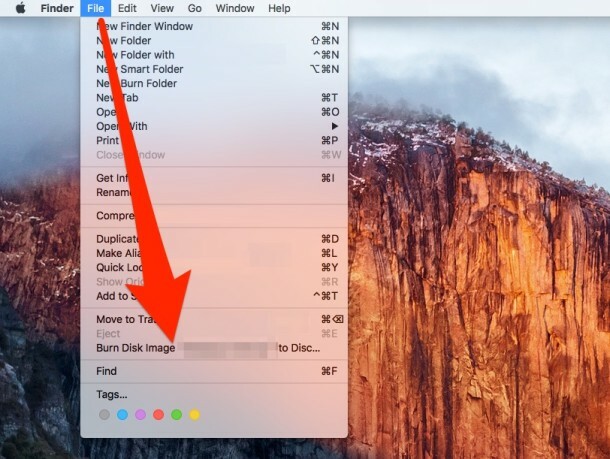 You can also access the “Burn Disk Image to Disc” option by right-clicking on an image file. This works to burn disk images and just data in general, OS X Is smart enough to know what to do with a DMG and an ISO. hdiutil will start burning the disk image file immediately assuming the syntax to the iso or dmg file is correct, and a CD/DVD drive with write abilities is found. The hdiutil command is quite powerful and it can create iso images as well as convert them, making it a valuable tool for users who don’t mind the Terminal. If for some reason you don’t want to use hdiutil, it remains possible to burn ISOs or other disk image from the command line using dd too.